Fern's Freebie Friday ~ Science: That's a Fact - Magnets - Fern Smith's Classroom Ideas! You are going to ♥love♥ this! My friend, Michelle at Teach123, has a wonderful freebie for you....handwriting worksheets in D’Nealian, cursive, and box print so you can integrate your science lessons with handwriting. My students are really enjoying these. I have started using them as bell work when they come into my Math and Science class. I also expand on it and encourage them to check out magnet books when they go to the library with their Reading teacher, the little boys are hooked! Please Take a Moment to Visit My Wonderful Freebie Friday Sponsors! If you missed last week's Freebie, I had a link to my favorite math center game, Doubles in Addition! In has been downloaded from TPT close to 91,000 times! I'm so excited for this Labor Day Weekend, my little Seminole is already driving home from college for the weekend! Hi Fern! Love your freebies! Maybe you can help me here. 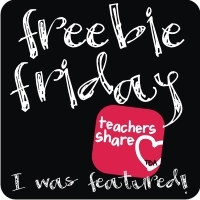 I have been trying to link up to the Freebie Friday on the Teaching Blog Addict blog, but I cannot find a place to link up anywhere. Thanks for any help you can give!